The problem I had with the CD was that most of the original songs were not interesting enough, with nothing in the lyrics or tunes to latch on to, with the tunes sort of wandering about a bit, rather than having much ‘punch’. There were titles such as Sabine’s Grind; Long Walk. One original that I did enjoy was Last Night, which did have clever sharp words about how changeable women could be, with a very jazzy tune. The other effective tracks were Bill Withers Lonely Town, Lonely Street, good lyrics and an interesting repeated riff to accompany the singer; Distel’s The Good Life, which had a voice and bass opening and a lively piano solo; and James Taylor’s Secret Of Life, with voice and piano only, which was very sensitively sung. This is a CD which I’d judge as a missed opportunity; others listeners may not agree. Available on Amazon, ITunes and CD Baby from 23rd January 2017. A sample is on soundcloud. 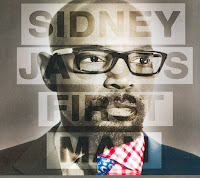 Sidney Jacobs (vocals); Zephyr Avalon (acoustic & electric bass); Michael Jarvey (piano, electric piano, viola); Josh Johnson (alto sax); Wendell Kelly (trombone); Josh Nelson (piano); Greg Poree (acoustic & electric guitars); Nolan Shaheed (trumpet); Justin Thomas (vibraphone, marimba); Cathy Segal-Garcia (backing vocal); Francesco Canas (violin).